EnCon entered the precast/prestressed concrete market in early 1993 with the acquisition of Stresscon Corporation, which was founded in 1969. Located on a 68-acre production facility in Colorado Springs, Stresscon Corporation maintains a second plant 20 miles north of Denver in Dacono, Colorado. Stresscon has been serving the Colorado and western United States building industries with quality architectural and structural precast concrete products and innovative building solutions for over 40 years. In 1997 EnCon acquired Atlanta Structural Concrete Company, founded in 1959, and built a new plant in Buchanan, Georgia. Atlanta Structural, with over 50 years in the structural precast industry, constructed a second production facility in Bainbridge, Georgia in 2006. Five additional plants were acquired or built between 1999 and 2004, providing manufacturing locations in Seattle, Portland, San Francisco, Los Angeles, Salt Lake City, and Denver. The EnCon family of companies now consists of nine production facilities. 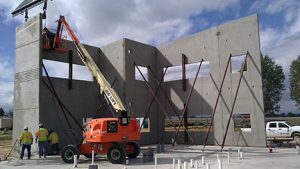 The product line includes architectural and structural building elements, bridge girders and deck panels, CarbonCast®, columns, double tees, prestressed beams, hollow-core, insulated and non-insulated wall panels, StructuralPlus® precast wall panels, noise walls, retaining walls, risers, spandrels, stairs, concrete tubes/shafts for stairs, elevator and other mechanical cores. As a certified producer of the Precast/Prestressed Concrete Institute and an AltusGroupTM Producer Member, EnCon is recognized among the leading precast companies in the United States. A broad range of products and exceptional service are the cornerstones of EnCon’s business philosophy. EnCon continues to expand to meet the rising demand for precast/prestressed concrete products and services through geographical and product diversification, cutting-edge design techniques, the development of innovative product lines, and a strategic corporate development program. The EnCon family of companies looks forward to increasing growth, leadership and service to the construction industry.